The college football season approaches the halfway mark in Week 6, and college football DFS players have another opportunity to cash in on a loaded slate. FanDuel is hosting a $45,000 CFB Wishbone, while DraftKings is featuring a $150,000 Run-Pass Option Special. Before entering these or any other Week 6 college football DFS tournaments or cash games, be sure to check out the top Week 6 CFB DFS picks from Mike McClure. He's a predictive data engineer and professional DFS player with almost $2 million in career winnings. McClure uses a powerful prediction model that simulates each snap of every game 10,000 times, taking factors like matchups, statistical trends and injuries into account. This allows him to find the best values and create optimal DFS lineups that he shares only over at SportsLine. They're a must-see for any CFB DFS player. In Week 5, he was all over Central Florida quarterback McKenzie Milton on both sites. The result: Milton exploded for 328 yards through the air, 51 yards on the ground and six total touchdowns against Pittsburgh. Anybody who had him in their lineup was well on their way to a profitable day. 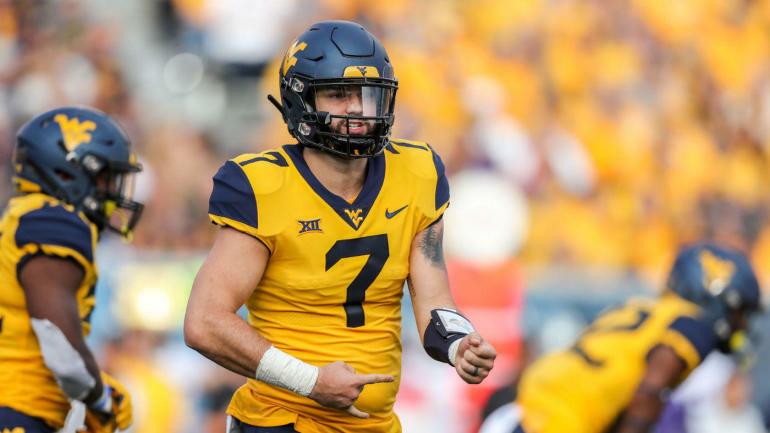 For Week 6, we can tell you McClure is banking on West Virginia quarterback Will Grier at $10,500 on FanDuel and $10,400 on DraftKings. Grier, a Heisman candidate, has thrown for at least 330 yards in every game. And he absolutely went off on Texas Tech last weekend, passing for 370 yards, three touchdown and no picks as the Mountaineers won a 42-34 shootout. He's stacking Grier with receiver Marcus Simms ($9,000 on FanDuel, $7,200 on DraftKings), who has gone off for at least 110 yards in his past three games. This is one of the top Week 6 college football DFS stacks because West Virginia should be able to overwhelm a Kansas secondary that just gave up over 300 yards and four touchdowns to Oklahoma State quarterback Taylor Cornelius in Week 5. McClure is also targeting a player capable of putting up massive numbers because of a dream matchup. This CFB DFS pick could be the difference between winning your tournaments and cash games or going home with nothing. So who is DFS pro Mike McClure putting in his optimal Week 6 lineup for college football? Visit SportsLine now to see full optimal college football DFS lineups for FanDuel and DraftKings from a professional DFS player who has almost $2 million in career winnings, and find out.